Janji offers high-performance running apparel with a twist: every piece helps bring water to developing communities around the world. Founders Dave Spandorfer and Mike Burnstein are competitive runners, who were discussing how even the smallest sip of water can make a big difference during a race. This conversation between friends became the idea for Janji, which means ‘promise’ in Malay. It’s a way for runners to give back through their everyday training. This socially responsible running apparel is sleek and durable. The distinctive geometric pattern—from hats and headbands to jackets and tights—is called Masai, and is inspired by traditional Tanzanian art. Masai apparel is Janji’s flagship pattern, and proceeds from the sale of each item will go to MSABI, a nonprofit that operates deep-water well projects throughout Tanzania. Only 47% of the rural population there has access to safe water, and your purchase can help provide a person with clean water for up to 3 years. Wear Janji on your next jog, and your runner’s high will have an extra feel-good boost of energy. Thank you for signing on today to learn about Janji running apparel. Through your purchase, we donate a percentage of our revenue to different organizations dedicated to providing water for developing countries. We look forward to hear your questions and comments. Hey guys, can't wait to hear your questions and comments!! Let me know how I can help! do you know when you might be making XXL for us runners with a little larger features than your normal thin, trim runners? @Sheldon great question. We hope to make more XL and XXL gear in the near future--we're just a small company and can't make too many sizes for now. But our goal is to be able to make a lot more sizes as we grow! Ordering the women's tights for my daughter and just looked at MSABI online and really like that you are contributing to them - we were in Tanzania recently and clean water is truly needed, I like the business model. @Ruth Thank you too much. They're an unbelievable organization truly deserving of support. For your daughter, if she's between sizes I would definitely order up a size (so a small to a medium would be a medium). They're great tights though!! @Dave I am curious about the decision to have the women's top be so plain, while the men's is beautiful, reminds me of birds where the men get to be the adorned ones! I know the tights have pattern, but what if you want to get just one and still have the benefit of Tanzanian designs? @Kathryn fantastic point. As you suspected, we wanted to make the women's top a little more subdued so it would match and merchandise well with the crazy tights. We definitely want to make many different 1/4 zip tops in the future: some simple, some with flare, and some that would be absolutely out there. I think the designs themsleves would be great with fluorescent colours. Also it would be nice to see more light weight gear for tropical runners. Thanks for the feedback, Eliza! I'm sure Dave is thrilled to hear what dedicated runners like yourself think could improve Janji apparel in the future. @Mike @Eliza. You're so right!! We love bright colors, but we also just loved the designs of these pieces and how bold some of them are. Keep the feedback coming!! Janji offers high-performance running apparel with a twist: every piece helps bring water to developing communities around the world. Founders Dave Spandorfer and Mike Burnstein are competitive runners, who were discussing how even the smallest sip of water can make a big difference during a race. This conversation between friends became the idea for Janji, which means ‘promise’ in Malay. It’s a way for runners to give back through their everyday training. 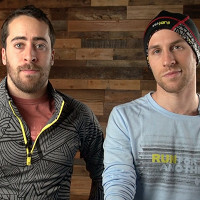 This socially responsible running apparel is sleek and durable. The distinctive geometric pattern—from hats and headbands to jackets and tights—is called Masai, and is inspired by traditional Tanzanian art. Masai apparel is Janji’s flagship pattern, and proceeds from the sale of each item will go to MSABI, a nonprofit that operates deep-water well projects throughout Tanzania. Only 47% of the rural population there has access to safe water, and your purchase can help provide a person with clean water for up to 3 years.